From Hay-on-Wye along minor roads. The road from Abergavenny, via the Llanthony Valley, is a single track and should not be used. Park in the main car park at the foot of the Bluff. Hang glider pilots may also park in the car park at Gospel Pass. Do not park on the roads or passing places. Gospel Pass NW Take-off (A). This take-off is for hang gliders only. In stronger winds, it is possible to take-off from the mound (E) at the foot of the hill and climb up onto the main ridge. In lighter winds, or for less experienced pilots it is recommended to carry up to the top of the hill, a hard carry up. The top take-off is steep but friendly. The Bluff NW Take-off (B). A long hard carry up. Hang gliders and paragliders should take-off from the area between the top of the main path up the hill and the trig point. The Bluff NE Take-off (C). A long hard carry up. Hang gliders and paragliders should take-off from the obvious grassy saucer shaped area immediately adjacent to the trig point. No launching from below the top of the hill. Always use the agreed top take-off areas at the Bluff and at Gospel Pass or the lower take-off area at Gospel Pass. Paragliders may experience dead air and rotor just behind take offs, making it a tricky site in strong winds. 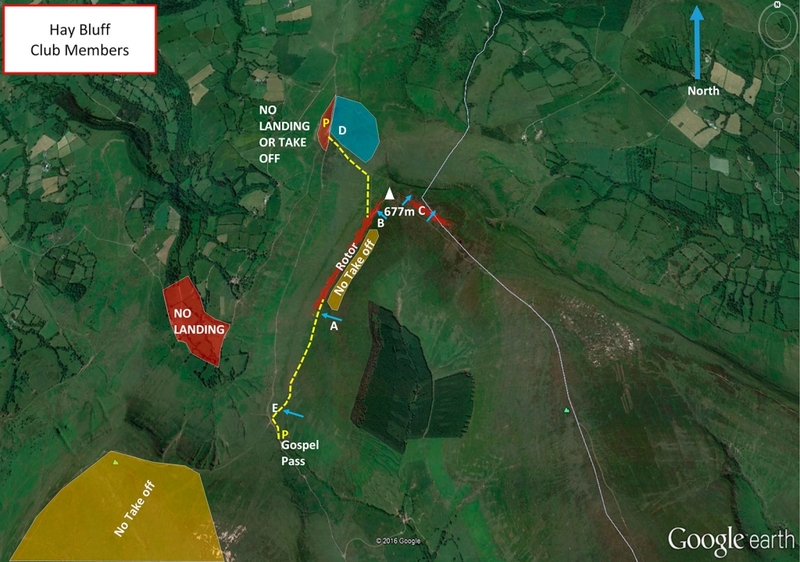 Update 2018 – Lord Hereford’s Knob has been officially negotiated as a take-off ONLY for pilots who have flown XC TO there (the land just to the west of Gospel Pass). It is not an option for initial take-off. The top landing area is large but the ground is quite rough. Always top land away from gliders taking off. Bottom landing is only permitted on rough ground (D) at the foot of the Bluff. Do not land in the car park! Hang gliders need a careful approach as the ground slopes gently towards the road and the gorse can all too easily catch the base bar, with unpleasant results. Hang glider pilots may also land on the lower take-off (E) at Gospel Pass. There can be a large lift band which extends out beyond the road in good conditions. This site has a very pronounced venturi and can be far windier on the top than in front of the ridge, so check before top landing. Beware of sailplanes from the nearby club at Talgarth. Beware of rotor behind the NE cliffs and rotor on the NW ridge in strong winds. This is a sensitive site. Please show consideration towards other users of the common and help reduce pressure on car parks by sharing transport wherever possible. This is a Site of Special Scientific Interest (SSSI), please treat it with respect. The site is closed Monday – Friday from the 1st – 31st May each year for lambing. (ie. During May, the site may only be flown on Saturdays and Sundays). 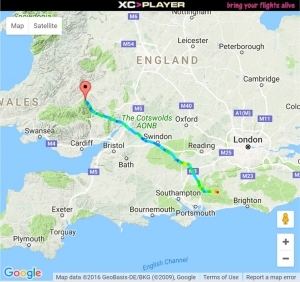 PG – Mark Watts and Hugh Miller had a great flight on the 17th April 2016 flying 204.5km. Hay Bluff Mountain, Brecon Beacons National Park. 6.1km SSE of Hay-on-Wye.